When it comes to mid-summer and the solstice the first, and sometimes the only thing that I can think about is Stanley Tucci’s version of Puck in a Midsummer night’s dream. I have such vivid memories of that movie… and of Michelle Pfeiffer. I’ve brought it up to people before, but most just look at me oddly and claim they don’t recall such a film and that I must be suffering from the Mandela effect. I’m not! It’s real! Look it up! Such a strange time – 1999. As I pondered on Puck, and the blazing heat we are having here in ‘tropical’ North Carolina, I knew that a cocktail was the one, sure-fire, we needed to create for Litha. 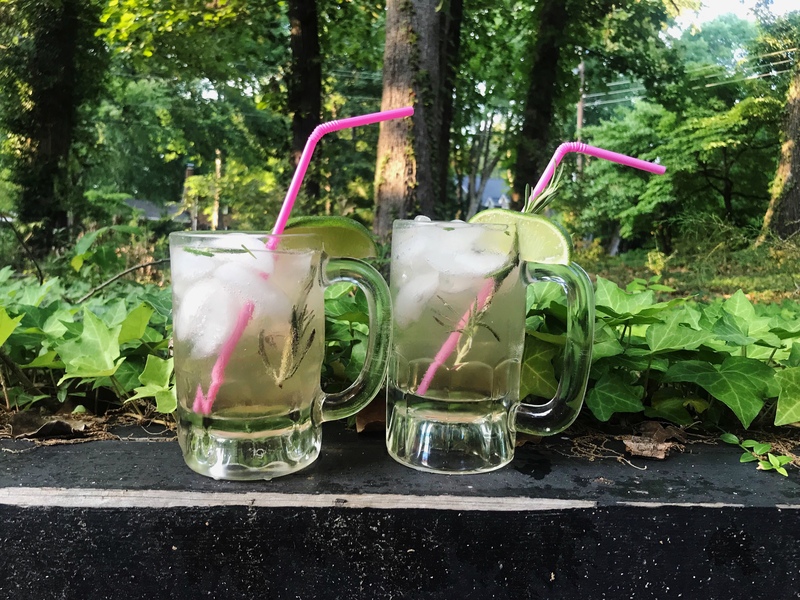 So with the help of our cocktail guru, Jessica, we came up with the perfect drink to sip on during the summer solstice. Inspired a bit by the Tom and Rosemary Collin’s, but with a playful twist (Just like Puck!) this beaut is crisp, and refreshing without being overbearingly sugary or fruity. It’s down to earth, earthy and doesn’t take much to make. Allow me to introduce you to Rosé Colored Glasses. Sparkling Rosé – Not to be confused with regular Rosé. The bubbles are key! Start off by adding 1/4 tsp of sugar in each glass. Quarter your lime, de-seed and squeeze one quarter into each glass. Muddle four pieces of rosemary with the lime and sugar mixture. Add one shot of gin to each glass. Stir to dissolve sugar. Fill glass with ice and stir once more to mix. Top with sparkling rosé. Garnish with a sprig of rosemary and a slice of lime. Cheers! What kind of summer cocktails are you into?